here is a beauty blog backtrack written for kiki creates. i recently wrote a post on How To Wax Your Eyebrows. waxing your eyebrows vs. your legs are like comparing apples to oranges. you might be thinking "uggghhh" but winter is the perfect time to begin your waxing routine. waxing your legs requires you to grow out your leg hair to approximately 1/4 inch so that the wax will have something to grip to. who wants to grow out their leg hair during the summer? growing your hair out now will be a cinch since we're wearing pants (or trousers if you're British) constantly. beginning this routine helps slow the growth of your leg hair, and over time the maintenance becomes easier and easier. doing this yourself is simple, easy, and relatively inexpensive. trust me, i have owned my own waxer for 8 years and it is so EASY to do this yourself! gather your supplies. for this you will need muslin fabric or waxing paper strips cut to desired size, a popsicle stick applicator, and wax. i have a professional wax warmer, but this is not a necessity for at home waxing. i do prefer using GiGi wax. it is the wax used by professionals and it works great. once your wax is warmed and your legs are clean (don't forget that hair needs to be at least 1/4 inch) you can apply wax. using a 45 degree angle, apply a thin layer of wax in the direction of hair growth. the area of wax should be equal to 2/3 of your muslin wax strip. 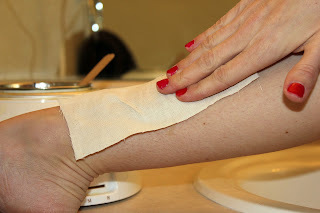 lay muslin strip over wax and press firmly, again in same the direction of hair growth. hold skin taught and pull wax strip off with one quick motion in the opposite direction of hair growth. immediately apply pressure to the waxed area with the palm of your hand to sooth the skin. NEVER reapply wax to newly waxed areas. finish with GiGi's After Wax Cooling Gel, Aloe Vera, or Baby Oil. enjoy your smooth, newly waxed legs. i am sure your significant other will appreciate it come Valentine's Day. wish you a wonderful weekend and please visit me soon. I do enjoy smooth legs, but still can't bring myself to wax. Perhaps I will get up the courage after this. 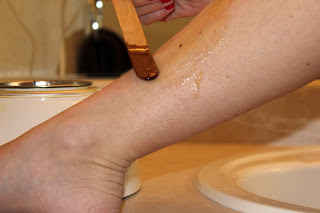 After you wax the first time, do you wait until your leg hair is 1/4 inch again to wax or do you wax sooner? Rachael, I do wait until hair has grown back 1/4 inch again. Growback from waxing is different than growback from shaving. With shaving, your hair is all the same length and grows back at the same time. With waxing, it grows back much sparser because the hair has been ripped out by the root, and some folicles are slower to regenerate than others so waiting until your hair is 1/4 inch isn't as obvious.